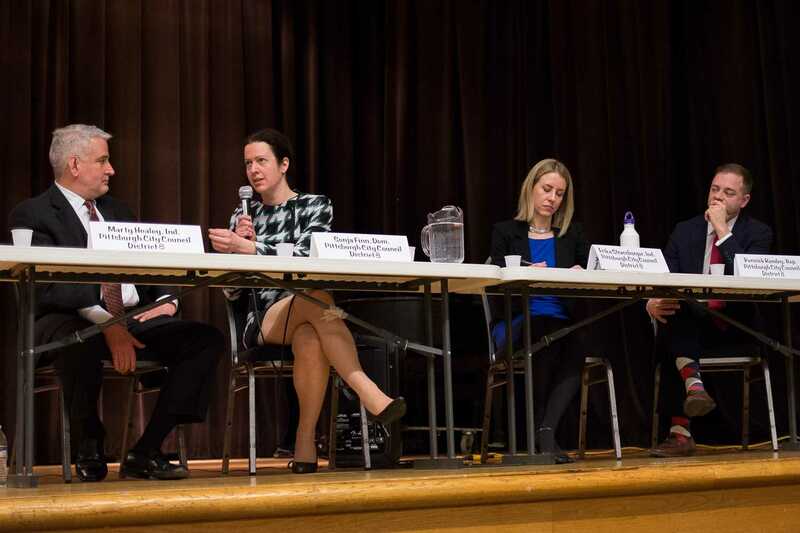 When the four District 8 City Council candidates sat behind a table onstage at the Jewish Community Center in Squirrel Hill, Rennick Remley — the only Republican running in the election — observed that he stood out from the group. Remley and Democratic nominee Sonja Finn joined Marty Healey and Erika Strassburger — who are running as Independents after losing the Democratic nomination to Finn — at a town hall forum Thursday night. The candidates, who are seeking to represent parts of Oakland, Point Breeze, Shadyside and Squirrel Hill, discussed topics such as gun control, air and water quality, teacher unionization, immigration and affordable housing. About 200 people attended the forum — the last one to be held before the March 6 special election that was triggered by Dan Gilman vacating the seat. Each of the candidates come from different backgrounds. Finn owns Dinette, a local restaurant, Healey works as a financial officer at his family’s company, the Healey Company, Strassburger serves as the current Chief of Staff of District 8 and Remley is the corporate relations manager at the Pittsburgh Ballet theatre. A volunteer from the JCC led the forum-like conversation and asked candidates select questions from audience members. Water and air quality received particular attention, as each candidate agreed these areas are in need of improvements. Finn said “we’re all a little fed up” that the Allegheny Health Department was not pushing the Clean Air Act. While all four candidates agreed getting clean air and water into the City is a top priority, they disagreed on the route for achieving this goal. Finn suggested targeting the Allegheny Health Department, Strassburger advocated for better infrastructure, Healey called for help from other cities and Remley suggested a public-private partnership between the Pittsburgh Water and Sewer Authority and local corporations. Remley was referring to the partnership that spawned when Pittsburgh hired Veolia Water in 2012 in an effort to improve the City’s water. The partnership ended in 2016 after water tests revealed that lead levels in the water had risen since 2012, indicating that Veolia Water had not helped the situation. The four candidates had different views about how to treat other corporations as well — specifically Amazon, which could potentially establish a second headquarters in the City. Remley and Healy welcomed corporate expansions because of their tax contributions to the City, but Finn worried that corporate expansion was driving up housing prices to the point where living in Pittsburgh would no longer be affordable. “Those are not just people who are low income, those are people who are ostracized in other ways, we need to stand up for them,” Strassburger said. “We need to look at how much land is owned by UPMC and the universities. I think bringing them to the table and not just asking for [money] and begging for it, we need to make a deal that works for us and them,” Healey said. Joe Charmy, a 90-year-old audience member who has lived in Squirrel Hill since 1955, agreed with some of the issues the candidates saw with UPMC. Audience members, however, agreed Pittsburgh also had assets. Naomi Stein, 30, who just moved to the City from Boston, said that in comparison, Pittsburgh is affordable. The candidates ended the forum by stating their reasons for running for City Council. All four expressed their desire to help fix Pittsburgh out of love for the City. Remley described the City as “vibrant, diverse and full of promise” and said he was running in order to fulfill that promise, which was not being kept — pointing to subpar plowing services and water pollution as examples. “If you can’t get the little things right, how the hell are we going to get the big things right?” he said.